The Hebrew word Kosher means "fit." The Kosher laws define the foods that are fit for consumption for a Jew. The Kosher laws were commanded by G-d to the Children of Israel in the Sinai desert. Moses taught them to the people and wrote the basics of these laws in Leviticus 11 and Deuteronomy 14; the details and particulars were handed down through the generations and eventually written down in the Mishnah and Talmud. To these were added various ordinances enacted through the generations by the rabbinical authorities as "safeguards" for the biblical laws. Throughout our 4000-year history, the observance of Kosher has been a hallmark of Jewish identity. Perhaps more than any other "mitzvah," the Kosher laws emphasize that Judaism is much more than a "religion" in the conventional sense of the word. To the Jew, holiness is not confined to holy places and times outside the everyday; rather, life in its totality is a sacred endeavor. Even the seemingly mundane activity of eating is a G-dly act and a uniquely Jewish experience. A land animal is Kosher if it has spilt hooves and chews its cud. It must have both Kosher signs. Examples: cows, sheep, goats and deer are Kosher, while pigs, rabbits, squirrels, bears, dogs, cats, camels and horses are not. Fowl: The Torah lists 21 non-Kosher bird species -- basically all predatory and scavenger birds. Examples of Kosher birds are the domestic species of chickens, ducks, geese, turkeys and pigeons. Fish & Seafood: A water creature is Kosher only if it has fins and scales. Examples: salmon, tuna, pike, flounder, carp and herring are Kosher, while catfish, sturgeon, swordfish, lobster, shellfish, crabs and all water mammals are not. All reptiles, amphibians, worms and insects -- with the exception of four types of locust -- are not Kosher. Thus, only milk of Kosher mammals is Kosher. Additional kashrut provisions pertaining to milk are discussed in Separating Meat & Dairy and Chalav Yisrael. The same applies to eggs: only eggs laid by Kosher birds are Kosher. In addition, all eggs should be carefully examined before use to ensure that they are free of blood spots. Honey is not considered an "animal product," so honey is Kosher though bees aren't. Pareve foods are neither "meat" nor "dairy." Eggs are pareve, as are all fruits, vegetables and grains. Pareve foods can be mixed with and eaten together with either meat or dairy. Kosher mammals and birds are slaughtered by a special procedure called shechitah, in which the animal's throat is quickly, precisely and painlessly cut with a sharp, perfectly smooth knife (called a chalaf) by a shochet -- a highly trained, Torah-observant and G-d-fearing individual. An animal that dies or is killed by any other means is not Kosher. It is also strictly forbidden to eat flesh removed from the animal while it is alive (this prohibition is actually one of the Seven Universal Noachide Laws and is the only Kosher law that applies to non-Jews as well as to Jews). Fish do not require shechitah. After the slaughtering, the internal organs of cattle and fowl are examined for potentially fatal diseases or injuries, such as adhesions (sirchot) in the lungs or holes in the stomach. The occurrence of any one of dozens of specified tereifot, as these defects are called, renders the entire animal not Kosher. Nikur ("deveining") involves removing certain forbidden veins and fats from cattle. They are extremely prevalent in the hindquarters, and due to the complexity involved in their removal, this part of the animal is generally not sold as Kosher. The liver, which has an especially high blood content, requires a special broiling process before it can be eaten. Eggs are carefully examined before use to ensure that they are free of blood spots. Fruits, vegetables and grains are basically always Kosher, but they must be insect free. Produce grown in the Land of Israel has special kashrut requirements. "Tithes" must be separated before it can be eaten, fruit from the first three years following a tree's planting ("orlah") is unfit for consumption, and special laws govern the produce of shemittah, the sabbatical year. For other issues that can possibly affect the kashrut of vegetable products see Wine, Bread and Cooked Foods and The 1/60th Rule. The Kosher laws stipulate that all dairy products should be Chalav Yisrael (lit., "Jewish milk"): a Torah-observant Jew must be present from the milking to the end of the processing to ensure that only milk from Kosher animals is used. In certain western countries (including the US) it is illegal to market milk from non-Kosher animals as "milk." Some halachic authorities therefore permit using non-chalav yisrael milk -- in places where chalav yisrael is not obtainable -- and to rely on government inspection as sufficient assurance. Others, however, point out that in addition to the technical reasons for the law, there are spiritual reasons for the requirement to use only "Jewish milk." 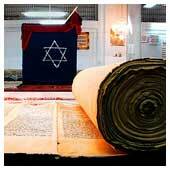 All agree that it is preferable to use only chalav yisrael. In a series of rabbinical ordinances instituted as a safeguard against intermarriage and assimilation, the Sages forbade the consumption of the wine, bread and cooked foods of a non-Jew, also when these do not contain any non-Kosher ingredients. The prohibition of food cooked by a non-Jew only applies in the following cases: a) it is a food that cannot be eaten raw; b) it is an important food, "fit to be served at a king's table." The prohibition of non-Jewish bread applies to home-baked bread, not to bread prepared in a commercial bakery. Nevertheless, it is the custom of many communities to use only pas yisroel ("Jewish bread") rather than avail oneself of this leniency. If a Jew is involved in any part of the baking or cooking process (e.g, he turns on the oven), the baked or cooked food is permitted. Sephardic tradition requires the food to actually be placed on the fire by a Jew. Even a small trace of a non-Kosher substance -- as little as 1/60th (1.66 percent) of the food's volume, and in certain cases, even less than that -- will render an otherwise Kosher food not Kosher. By the same token, utensils that come in contact with hot food will absorb its "taste" and subsequently impart it to other food. For example, a loaf of bread baked in a pan smeared with shortening that contains a small percentage of lard, fruit juice pasteurized in the same machinery as non-Kosher milk, or a vegetarian dish prepared in a restaurant kitchen with the same utensils in which a non-Kosher dish was cooked earlier -- these would all be regarded as non-Kosher if the proportion is greater than the permissible percentage.